As any regular and honest reader of NC Policy Watch can attest, our websites are no hotbeds of liberal love for Governor Perdue. Through the years, it’s fair to say that she’s goten mixed reviews in our various publications. Though we’ve praised her performance many times, we’ve also given her heck on multiple occasions. According to the Pope people, Perdue has no right to criticize them because she signed a budget in 2009 that cut education funding. How dare she criticize them now, say the Pope-sters, for doing what she did herself? 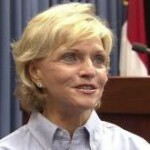 “When Governor Perdue came into office in 2009, the national economy (and. thus, state revenues) were both in a 200 m.p.h. free fall – the worst since the Great Depression. Nonetheless, despite this dire and essentially unprecedented situation, Perdue and the Democratic General Assembly acted to: 1) renew temporary taxes that had been scheduled to expire and 2) draw down as much federal aid as possible. The result was that damage was minimized. Rather than the truly draconian measures taken in other states like shortening the school year and closing vast numbers of schools,North Carolinamuddled along more or less intact. Cuts were painful – especially the first year – but not nearly as disastrous as they would have been if Perdue had heeded the conservative, Herbert Hoover-like advice to do nothing. Of course, many thoughtful people would have liked to have seen Perdue and the Democratically-controlled General Assembly do even more, but at least both did act. They took strong, intentional action to minimize harm. Now, flash forward to 2011. With the economy finally beginning a gradual turnaround, revenues were still severely depressed but not falling like 2009. It was an obvious time to recover lost ground. Nonetheless, because of conservative obstructionism in Washington, any hope for additional federal stimulus assistance had been dashed. Thus, even with an end to the economic free fall, the need for state income was desperate if leaders were going to replace the expiring federal stimulus dollars. So what did conservative legislative leaders do when confronted with this crisis? The answer, of course, is that they cut taxes and took state spending back to the levels of the early 1970’s. At a point in time in which their services were more important than ever, thousands of education professionals (not to mention thousands of additional important public employees working in dozens of other critical areas) were let go – all so State residents could receive a tax cut that most of them have not noticed and thought was unnecessary (with the notable exception of the many wealthy individuals and corporations – whose accountants knew quite well what they were receiving). To the Tea Party base, Speaker Tillis and his allies brag about slashing government and their plans to privatize public education – i.e. what they’ve actually done or commenced. In polite company, however, the Republicans’ tune changes. That’s when, realizing as they do that most voters don’t go along with their extreme, far right ideology, the spin and word parsing about increasing the number of “state funded” teachers begins. Sadly, this is a familiar pattern to anyone who’s watched the debate on Jones Street over the last year. You forgot one of Governor Perdue’s really, really big whoppers told today. We are still waiting for the NC Department of Public Instruction to report local, federal, and capital revenues/expenditures for the current school year, so I assume that Gov. Perdue is referencing total state expenditures on K-12 public schools. According to NC DPI statistics, state public school appropriations for the current school year totaled $7.5 billion. A year before, state appropriations reached $7.15 billion. (See Highlights 2012, p. 2 below) In other words, there were fewer dollars in the public school system during the 2010-11 school year than the 2011-12 school year. Civitas and AFP have been parsing their words more frequently and carefully today than Mitt Romney discussing Massachusetts’ health care system or Newt Gingrich discussing the need to respect the institution of marriage. You are willfully ignoring the fact that education funding comes from other sources. JLF is excluding federal funds from the picture. Add the federal funds to the state funds from the document JLF is citing and you will see that Gov. Perdue’s statement was correct. The NCGA doesn’t operate in a vacuum. Everyone knew about the EduJobs funds. Yet, they stood by while those teaching jobs vanished and now you are trying to clean up their mess for them. Dallas, the locke foundation, much like it’s parent, the heritage foundation are not reliable sources of information. In 2008 “State Funding” for public K12 was $8.19 Billion. “State funded teacher” positions in 2012 were lower than in 2010, 2009, 2008, 2007, 2006. One year is not a trend. Here’s the budget data for the last several years. Correction: In 2009 “State Funding” for public K12 was $8.19 Billion. In 2008 “State Funding” for public K12 was $7.91 Billion. Imagine how much funding could be available for public education if we cut back on Pre K spending and divert those funds to actual education not free daycare. Not one dime of lottery receipts should be used for Pre K.
Let’s not pretend you care about the money Frank. If you did you would realize that schools are cheaper than prisons and public assistance. If you did you would realize that an education population would more than pay for itself in tax revenues and economic impact. Resentment maybe, but certainly not money. PreK does nothing to decrease the prison population and is nothing more than a free day care so quit pretending its “education”. Just look at the potential if those funds could be used for something actually useful like actual education. If we did that, we would not be having this discussion and Gov Perdue would not be receiving those cheap shots which she richly deserves. Frank, Rob and Jeff aren’t interested in dialogue, only disparagement, as any regular and honest reader of this site will attest.